UN Ambassador Nikki Haley to Leave Trump Admin. Nikki Haley, the U.S. ambassador to the United Nations, announced in the White House with President Donald Trump that she will resign at the end of the year, saying it was time for someone else to do the job. The news blindsided some key U.S. allies and many congressional Republicans involved in foreign policy matters. And it came less than a month before congressional elections, thwarting White House efforts to project an image of stability, with the loss of one of the highest-profile women in the administration at a time when women's votes are being vigorously pursued. But Haley, the former South Carolina governor, has often been an unpredictable and independent force in the Trump administration. At times she has offered strikingly different perspectives on world events from her more isolationist-minded boss. A smiling Haley announced her decision at an Oval Office meeting alongside the president, bringing up her own political prospects even as she underscored her continued support for Trump. Without prompting from reporters, she said she had no plans to run for president "in 2020" and would campaign for Trump. Haley, who is 46 and not personally wealthy, hinted in her resignation letter to Trump that she is headed to the private sector. "I have given everything I've got these last eight years," she said, referring to her six years as governor as well as her time at the U.N. "And I do think it's good to rotate in other people who can put that same energy and power into it." Trump was asked why the announcement was made now since Haley is staying until the end of the year. Instead of answering directly, he recounted how she has had to work on tough issues, such as Iran and North Korea. White House officials had sought to put a hold on Trump's record-setting turnover in the run-up to the Nov. 6 elections, with aides being asked months ago to step down or commit to stay through Election Day to avoid adding to a sense of turmoil. Still, the prospect of post-midterm changes continues to hang over the West Wing, and Haley's exit was one that has been discussed, according to a senior administration official not authorized to publicly discuss private conversations. President Donald Trump on Tuesday emphasized nations’ sovereignty over global governance in his second address to the United Nations. A number of officials speculated that the timing was meant to preserve the ambassador's own political future. A post in the Trump administration has proven to be a rickety stepping-stone to either lucrative private sector work or hopes for higher office, and the risk to those ambitions might only increase after the elections if Democrats make significant gains in Congress. Trump said Haley first discussed leaving with him six months ago. The senior official noted that their conversation coincided with the appointments of Mike Pompeo as secretary of state and John Bolton as national security adviser in an earlier upending of top foreign policy officials. 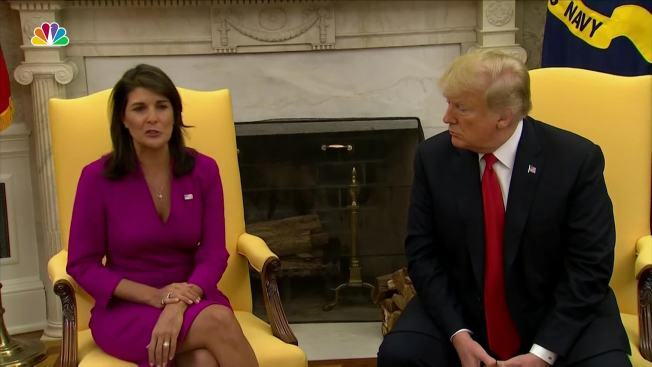 Haley had expressed some frustration that her voice had been diminished as the two men became the aggressive new faces of Trump's international policy, the official said. More recently, there was the awkward moment at the U.N., when Trump's boasting of American economic strength under his leadership brought laughter at a General Assembly session. He insisted later that the delegates were laughing with him, not at him. The six-month timeline also coincides with a high-profile spat between Haley and the White House in April, when she drew the president's ire for previewing in a television appearance the administration's planned imposition of a new round of sanctions on Russia. When the sanctions never materialized, White House officials said the plans had changed without Haley being briefed, and economic adviser Larry Kudlow suggested she was confused. "I don't get confused," Haley said in a sharply worded response to the West Wing. Haley was appointed to the U.N. post in November 2016 and last month coordinated Trump's second trip to the United Nations, including his first time chairing the Security Council. U.S. Ambassador to the United Nations Nikki Haley sent a veiled warning to the U.N. that countries which vote to condemn the Trump administration for its decision to recognize Jerusalem as the capital of Israel could face retaliation. A rookie to international politics, the former South Carolina governor was an unusual pick for to be U.N. envoy. "It was a blessing to go into the U.N. every day with body armor," Haley said, saying her job was to defend America on the world stage. 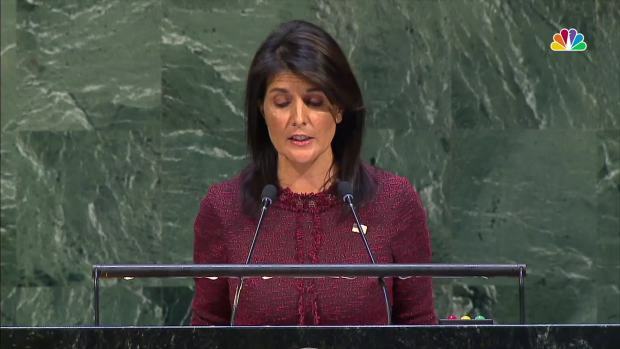 At the U.N., she helped spearhead the administration's efforts to combat what it alleged to be anti-American and anti-Israel actions by the international body, including the U.S. decision to leave the Human Rights Council and to stop funding the U.N. agency for Palestinian Refugees. Haley also secured three successively tougher Security Council sanction resolutions against North Korea — which the administration has credited with bringing Kim Jong Un to the negotiating table — and an arms embargo against South Sudan. But under Haley's tenure at the U.N., the U.S. has faced strong opposition from Russia when it comes to addressing the seven-year-old war in Syria, and frustration from European allies over reimposing nuclear sanctions against Iran. Trump told reporters aboard Air Force One he was considering five candidates for Haley's job and that a successor would be named in two to three weeks — or maybe sooner. Among those under consideration, Trump said, is former deputy national security adviser Dina Powell. Trump told reporters that he has heard his daughter Ivanka Trump's name discussed for the post, but said if he selected her he'd be accused of nepotism. In a tweet, the presidential senior adviser and eldest daughter praised Haley, saying Trump will "nominate a formidable replacement for Ambassador." She added: "That replacement will not be me." Nikki Haley, U.S. ambassador to the United Nations, spent two days in Jordan and toured the Zaatari camp for Syrian refugees on Sunday. She said that the Trump administration's stated intent to slash humanitarian aid worldwide would not affect U.S. support for the crisis in Syria. U.S. Ambassador to Germany Richard Grenell's name has also been floated for the post, but Trump suggested he'd rather keep him in his current post "because he's doing such a good job." The daughter of Indian immigrants, Haley clashed with then-candidate Trump during the 2016 campaign, denouncing "the siren call of the angriest voices" that disrespected America's immigrants. Trump tweeted that "The people of South Carolina are embarrassed by Nikki Haley." Haley has one child in college and another approaching college age, and she has the potential to make much more money in the business world. She reported owing between $500,000 and $1 million on financial disclosures filed as part of her nomination to be U.S. ambassador to the United Nations. The debts included a personal mortgage of between $250,001 and $500,000, according to the report with the Office of Government Ethics. Before she was named by Trump to her U.N. post, Haley was elected the first female governor of South Carolina. She was re-elected in 2014. As governor, she developed a national reputation as a racial conciliator who helped lead the effort to bring down the Confederate flag at the Statehouse and helped guide the state through one of its darkest moments, the massacre at a black church.